Hello. I'm Kate Murray, Owner of Mathnasium of Forest Hill, your neighbourhood math-only learning centre. We help kids in grades 2-12 understand math by teaching the way that makes sense to them. Mathnasium of Forest Hill has been providing math help to students in our community since 2012. Our staff is passionate about helping your child become more proficient in math and really enjoy it! We offer year-round math programs as well as summer math programs. Mathnasium of Forest Hill has been voted Best of the Village for its educational services, and we are proud partners of the Breakfast Club of Canada. We are located in Forest Hill, along the Eglinton Way between Chaplin Avenue and Avenue Road. Come and visit us for a FREE Trial and see how we can help your child become CRAZY about math! For existing Mathletes, click below to schedule your next training session! My son loves to attend and wants longer lessons. Professional staff and a great concept to help and encourage your child to improve skills. I am extremely happy that we found mathnasium! The proof is self evident. Thanks Mathnasium - my kids love math! Mathnasium has changed my daughter's outlook on math, making it more fun and giving her confidence to learn. The 'what I Learned/what I got/what I need to improve" lesson recap form that she completes after each lesson is also a nice tool, along with the ongoing progress reports. We are very happy with our son’s progress and the team at Mathnasium. We will very likely be putting our other children in the program, thank you all. My daughter has been attending Mathnasium for over 2 years now and as a result as mastered many maths skills which she had somehow not acquired through her school education. The mastering of many maths concepts has increased significantly her confidence and her appreciation for maths. Thank you to the fantastic Mathnasium team of instructors. My kid is excited to come every week. We were just so pleased to see our kids excited about math and to see their confidence levels increase. They are both very comfortable with math now. I am very satisfied. However would like to have options to reduce frequency of sessions. Happy my daughter wants to come! She also feels better and less stressed. my Grandson seems to be benefiting from the extra help. and he is getting top marks at tests. Thank you Mathnasium! My son actually looks forward to Math! Great experience and amazing support for my son! The staff at Mathnasium are very knowledgeable. I appreciate that they are always open to discussing and providing additional feedback about my children and their learning. Our daughter Emma loves Mathnasium and is becoming more confident after each and every session. She rather be at Mathnasium than Gymnastics, Skating or Dance lol. I'm Shocked! Amazing staff and Leah is the absolute best! Sienna just loves going to mathnasium. She looks forward to it every time and that’s just awesome. Still early days, but so far so good! Looking forward to a status checkin when the time is right:) Love that there is no homework outside of the 2x week visits. The staff are great and know the kids by name when they walk in the door. Reagan loves that she gets to learn many different things in one session (e.g. not just patterns all day, but also doing addition, subtraction, etc). It keeps math fun and exciting!! Leah and all the staff at Forest Hill Mathnasium were excellent. From initial inquiry through all our sessions, we were very happy with the experience. We appreciate the steps taken to make Clara feel as comfortable as possible at the centre. She looks forward to attending each week. We’re really enjoying our experience at Mathnasium. The kids are feeling more confident in their math skills. The staff is very friendly, supportive and extremely flexible. We love it! My daughter loves going to Mathnasium. Everyone is so nice and welcoming. They are truly passionate about what they do and as much as they take it seriously, there is a fun side to being there. It is very interactive and confident building. I would definitely recommend Mathnasium to everyone. Great place and amazing staff. kids love and enjoy the math now. We love Mathnasium! The lessons are great, the methodology is great, and the feedback is great. The method is proven...it works...my daughter brought her mid term grade of a C to a final grade of a B+ ....strongly recommend ! Since the fall of 2016, my daugther who was having difficulties in only one topic at school, Maths, attended twice a week Mathanasium Forrest Hill. This is now her strongest topic with an average of 95%. She has regained confidence as any gap in basic principles and more have been addressed. Great team! My son feels so welcome at mathnasium. The staff make an effort to get to know him which increases his desire to attend the sessions. It’s a very welcoming place. His confidence and increased understanding of math concepts has increased dramatically. Thank you! Zac really benefited from his time with you guys. Thanks for your help, support, flexibility and great staff. Rachel is really enjoying her sessions with Mathnasium. We appreciate all the support. Her confidence has improved. We love mathnasium. All the staff are super friendly and nice and make the experience for my daughter to be amazing. My daughter loves going which is a bonus and she has been getting A’s in math now. We love mathnasium! Reagan said "it's awesome! It's not too hard and not too easy. And the teachers are nice and awesome." Focused and dtermin d to see my child succeed. We have been so happy with mathnasium. My son is excited to go and ends the hour confident and motivated to keep working hard! Mathnasium changed the way Rhys approaches Math. Rhys was a student at Mathnasium for 4 years. His marks in Math excelled the moment he joined the incredible team of teachers at the Forest Hill branch. He sees math as fun, challenging, exciting. Shockingly he looked forward to attending the program 2 times a week. It was never a fight to get him there. His math results at school only encouraged his enthusiasm. March 31, 2018 was Rhys's last day at Mathnasuim. We have decided to take a break after 4 years. Right now Rhys has to focus on his passing his black belt on May 26. We couldn't believe it but we were sad to leave the Mathnasuim family. Who would believe you could feel sad leaving a math setting.... Im sure we will be back....keep up the great work. Leah...we will miss you the most. Leah and her staff have done an incredible job inspiring my daughter and helping her build her confidence when it comes to math. When we asked to pivot our sessions a little bit to incorporate my daughter’s JUMP math homework and EQAO prep work, the staff was more than accommodating to ensure that there was some continuity with what was being learned at school. My daughter went to another math program previously and dreaded going. She has been at Mathnasium since last year and never complains and her math skills have significantly improved! I am so happy with my daughters progress. What a fantastic program! She looks forward to coming every week and see the results. She has gained so much confidence and coming to math is no longer a battle. Thank you! Great teachers and very well organized. Our daughter's math skills have improved significantly and she has a lot of fun at mathnasium. She is very fond of the teachers who are very patient and kind and seem to really enjoy what they are doing. The freedom to book sessions according to one's own schedule is a great aspect of your program. My daughter loves attending. My son absolutely loves coming and I just did refer you to a friend. Forest Hill Mathnasium is AWESOME! My daughter joined a month ago and is already 100% more confident in her Grade 5 math. I love the curriculum and how they will also help out with homework from school at the last 10-15 minutes. The rewards method also works well for my daughter. Great staff - so happy we are part of the club. Thank you! Zac want to continue coming and his marks have improved...what more could I want? Thank you!! My daughter liked going, looked forward to her time there. Which resulted in her math mark going up 30 points! I like mathnasium's approach. Given that children in grade 3 and up are regularly getting homework from school and have so many activities I really think the mathnasium approach of doing it all in the session makes practical sense. If I wanted to just give my daughter more homework I can go buy a math exercise book. The instructors all seem very good at getting the kids to think about why they solved a problem vs just focusing on the answer. The logic reasoning is one of the most important things to me about math. I like the flexibility to change and move the times around. It's great given that weekends are often so busy its nice to be able to switch times some times. Best experience to get my daughter up to speed and surpass where I thought she would get go. The most helpful, knowledgable staff and management. A pleasant experience. Excellent support. Always available to discuss. Excellent program for students. Thorough. Solid plan. Supportive, fun, positive environment. Staff are friendly and helpful to the parents and students. Prizes great motivators. Math games enjoyed by the students and good break. Like the bulletin boards seeing accomplishments. Like how students are taught to be independent. Well done!!! 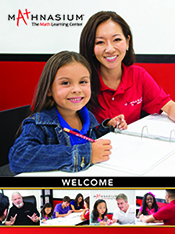 We think Mathnasium is a great program for kids. It helps and caters to their needs. It empowers them to succeed and pushes them past their apprehensions. Great convenient activity that even with multiple kids at a range of ages can participate in one stop. Engaging independent work with balanced nicely with interaction with instructors. We were very impressed with Mathnasium from our first point of contact right through to our final day and then weeks later when we received a thank you card in the mail for our child. I couldn't imagine that my boys would want to learn maths after school, I was shocked when my offer to reduce their sessions was met with complete and utter negation! Both boys improved their skills dramatically and learned that there are many ways to reach a solution. I am extremely happy that we found Mathnasium. It has been a great previledge to be a part of mathnessium family .Since my daughter started her sessions,she did very well in school considering that she's in AP Math,so she has to excell more effort studying since it is not a regular class but a special class.She gained more confident in solving mathematical problemas and throught the help of mathnessium team she enhance her skills on solving such mathematical issues. in fact her last exam she got the highest and scored 99%.Thank you so much for the wonderful experience and we look forward for the next semester. Despite having a degree in math and my wife being a teacher, we couldn't make math click for our daughter. It's still early in her tenure at Mathnasium but we're already seeing an improvement and she's always excited to attend her appointments. My daughters enjoy doing math here! Their teachers are very helpful and explain difficult concepts to my children in a way they understand it. They have excelled in math and I see progress in their school too! My daughters love math after going to Mathnasium. FH Mathnasium provides a valuable added source of information for students to acquire the skill-sets to succeed. Management and the tutors are very friendly and helpful as well. My daughter is not nervous or unhappy about attending Mathnasium . Nor is reluctant to go to class or afraid about writing her math tests. Her last test showed an approvement in her grades. So far so good. But we just started a month ago. Daughter enjoys going and I like the flexibility of schedule my on line. But hopefully her efforts will show up on her report card eventually. Director and teachers are focused on each individual and their learning needs. The environment is friendly and welcoming, and students receive good feedback. They also have opportunities for games and socialization in an educational way. Thank you Mathnasium. Our son really connects with the tutors at Mathnasium, it's great. My child is very happy with the program and is happy to attend every week. He is starting to feel more confident in his math skills. Instructors are great at the Mathnasium. They go extra mile to help every child even during the busy hours. They are kind and patient. My daughter has been enjoying going to Mathnasium and she does not want to miss her appointments. Thank you all so much. I have not seen real results yet but my daughter attitude has changed toward math she is more confident and claims that she understand math a lot better. She is also very willing to come to her session compare to the time that she had private tutor and felt uncomfortable and resistance. Leah makes the program what it is. My daughter loves going to Mathnasium. Best decision we ever made! My children LOVE coming to Mathnassium. The staff make everything fun. Learning math skills has developed into a love for math. Thank you. Everyone is very friendly and makes my daughter and I feel comfortable. She is learning a lot and loves the reward system. We had a great experience with Mathnasium. Our son was struggling with some concepts in grade 9 math. About a week before his final exam we realized just how much he was struggling and called Mathnasium. The help available and open learning environment helped him to learn the concepts he was struggling with. In a very short period of time, Mathnasium tutors were able to help him learn the concepts he was unsure about. We would absolutely recommend Mathnasium Forest Hill to friends/family and complete strangers. Mathnasium has been a huge help to our son... He has a more comprehensive understanding of math concepts and his confidence has skyrocketed! We've seen a tremendous change in our daughter's comfort level with math. Much of this can be attributed to your excellent programming and staff. Both of my kids enjoy coming to Mathnasium - they have fun with the instructors, who they look up to! Best part for me is that they have developed a better foundation and more confidence in their math skills. This means I have less work and less worry. We have been so pleased with Mathnasium. Brady's marks and understanding of math concepts has improved so much that he was actually ahead of the class. It has been a fabulous experience. Thank you! Mathnasium have been great for my two boys. They present math in comprehensive but fun. They have benefited from their sessions at mathnasium. My daughter has only been at 4 sessions but seems very happy. She feels a little more confident and seems to be having fun. That was really the goal. Not only has my daughter's math skills greatly improved, but she has also gained great confidence and loves going to Mathnasium. Thank you!! Summer Math Fun: Great Games for the Whole Family!